It used to be Global Warming, now it’s Climate Change. We’re talking about the same issues, so why did the terminology change? 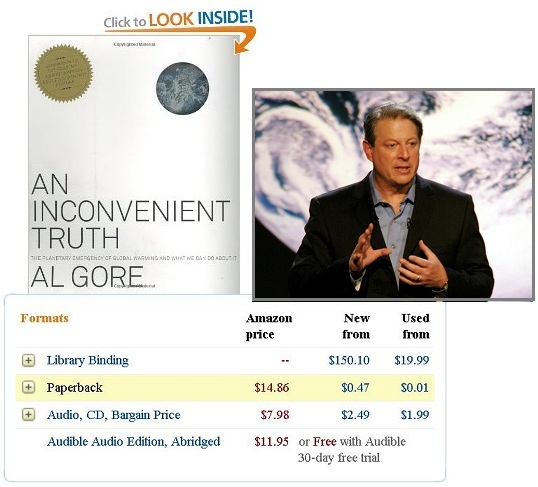 Remember Al Gore on the stage, promoting his 2006 book - An Inconvenient Truth? The term Global Warming is used in every sentence in this Amazon book description. What has gone amuck, that paperback copies of Gore’s book are now selling for $.47 for a new book, and $.01 if used? Gore’s newest book is avoiding the term Global Warming like the plague. Climate Change is the new term. Note the tag lines for the Huffington Post article on Gore’s new book, below: Climate Change, Climate Change, Al Gore, Climate Change, Climate Change, Video, Al Gore New Book, Al Gore Book, The Future: Six Drivers Of Global Change, Green News. Now even Lord Stern, one of the Global Warming activists in 2006, is using the new term. Both the book and film were inspired by a series of multimedia presentations on global warming that Gore created and delivers to groups around the world. With this book, Gore, who is one of our environmental heroes - and a leading expert - brings together leading-edge research from top scientists around the world; photographs, charts, and other illustrations; and personal anecdotes and observations to document the fast pace and wide scope of global warming. He presents, with alarming clarity and conclusiveness - and with humor, too - that the fact of global warming is not in question and that its consequences for the world we live in will be disastrous if left unchecked. We find ourselves in a period of rapid, simultaneous and exponential change, unlike anything the world has ever seen before. Trying to make sense of our new reality is a daunting challenge. The future holds both great opportunities to be taken advantage of and profound challenges to address. More so than ever before, humanity needs to unite around the principles of sustainability and democracy. We all have an important role to play in reclaiming control of our destiny. 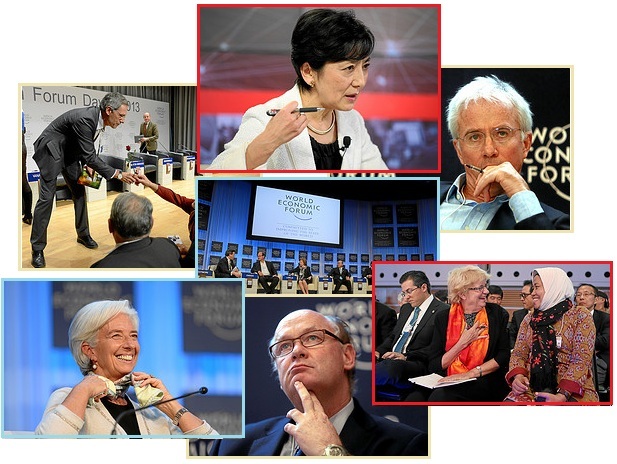 Lord Stern speaks out in Davos. The Stern review, published in 2006, pointed to a 75% chance that global temperatures would rise by between two and three degrees above the long-term average. Stern said he backed the UK’s Climate Change Act, which commits the government to ambitious carbon reduction targets. The Global Warming theory was always met with skepticism by the world’s scientific community, as outlined in Issue 15 of this newsletter on March 18, 2007. Then the UN, the driver behind the alarm over the supposed rise in CO2 and the anticipated rise in sea levels, was caught in a scandal. Data manipulation on the Global Warming statistics was uncovered, committed by the top UN scientists, as noted in Issue 162 of this newsletter on December 6, 2009. Al Gore was hanging on, trying to maintain the lie. Per the Zetas, the humiliation was just too much to bear, as noted in Issue 248 of this newsletter on July 3, 2011. Per the Zetas, the whole Global Warming fiasco has been an excuse for the Earth changes caused by the near presence of Planet X, aka Nibiru. ZetaTalk Warning 6/15/1996: The weather is blamed on global warming, the greenhouse effect, which in and of itself might be an explanation that would hold if weather were the only symptom. It is the heat from the core of the earth and the increased earthquake and volcanic activity that boggles these attempts at alternative explanations. The heating of the oceans and increasing tremors are thus blamed on solar flares, even though such activity in the past was never associated with solar flares. Now that the terminology has morphed to address the weather extremes - the drought and deluge and raging storms along the coastlines - what will become of all the legislation forcing corporations to reduce their carbon footprint? Per the Zetas, the Global Warming fraud will never be admitted, even after the near presence of Nibiru is admitted, because the lawsuits would be never-ending. A secretive funding organization in the United States that guarantees anonymity for its billionaire donors has emerged as a major operator in the climate "counter movement" to undermine the science of global warming. Anonymous private funding of global warming skeptics, who have criticized climate scientists for their lack of transparency, is becoming increasingly common. ZetaTalk Comment 7/28/2012: Will the Global Warming advocates turn their palms up when Obama announces the presence of Planet X, admitting they were a disinformation campaign all along? Or will they bluster and insist there is no relationship. They will do the latter, as to admit a disinformation campaign brings much backlash, not only anger toward those who perpetrated the scheme but lawsuits for damages by those who were forced into expensive retooling in order to reduce their carbon footprint. Unless there is a leak of emails showing the participants knew they were foisting a lie upon the public, then energetic bluster and a continuation of the current policies should be expected. The lie will continue. 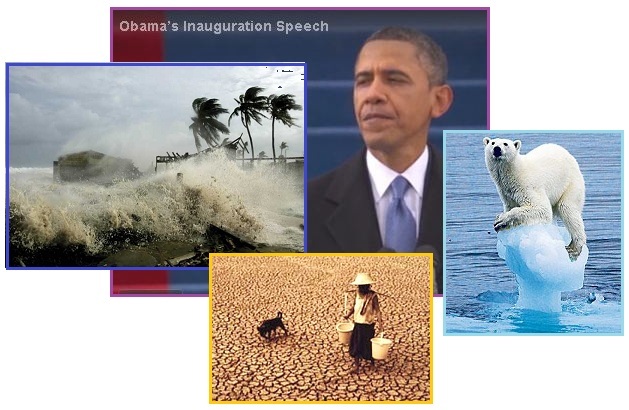 The push will be to address Climate Change, which is of course very real and just getting started, as Obama well knows. After the defeat in 2010 of legislation that would have capped carbon emissions and issued tradable permits for emissions, Mr. Obama turned to regulation and financing for alternative energy. Despite the lack of comprehensive legislation, emissions have declined roughly 10 percent since he took office, a result both of the economic slowdown and of energy efficiency moves by government and industry. 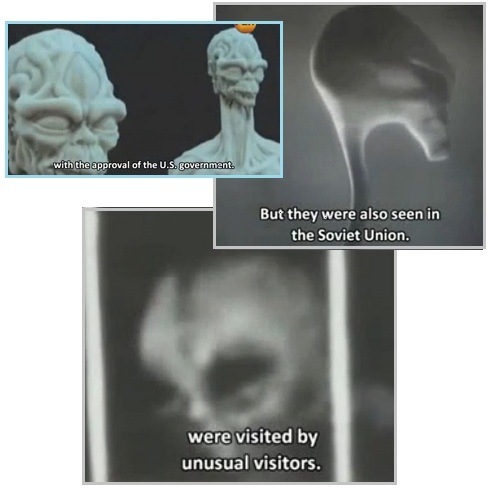 Are the Russians about to disclose that the alien presence is real? Former President Medvedev was certainly hinting around recently, as noted in Issue 327 of this newsletter. He referenced a Russian made-for-TV documentary called Men in Black, which is not the American movie by the same name. This documentary covers Roswell, secret alien bases in the US, “levels of secrecy” in the US where even the President does not know, UFO sightings on the increase, abductions and visitations in Russia, attempts by the CIA and in Russia to deny the alien presence and belittle those making reports, intimidation by tall pale faced men dressed in black, technology assumed secured from the aliens, speculation on deals made between the governments and alien groups in exchange for technology, confusion over the alien agenda, and speculation the aliens are here to protect the Earth from destruction. A stunning Ministry of Foreign Affairs report on Prime Minister Medvedev’s agenda at the World Economic Forum this week states that Russia will warn President Obama that the “time has come” for the world to know the truth about aliens, and if the United States won’t participate in the announcement, the Kremlin will do so on its own. Medvedev is scheduled to open this years Forum where as many as 50 heads of government, including Germany’s Angela Merkel and Britain’s David Cameron, will attend the five-day meeting that begins on 23 January. The revelation that life could be sustained elsewhere in the Universe, and what this might mean for human societies, is on the agenda at the 2013 World Economic Forum in Davos, Switzerland. Per the billing, this is limited to the populace becoming aware that life could exist elsewhere. This is not even addressing what a revelation about intelligent life visiting Earth might mean. The World Economic Forum is just contemplating how mankind might react if they realize Mars has moss and bugs and an atmosphere, much less that the Annunaki lived there in the past or that aliens are contacting mankind willy-nilly all the time. Even the Vatican has grappled in 2009 with what such a revelation would mean, anticipating that the cover-up over the alien presence will unravel. And the UN reportedly appointed an ambassador to greet other worldly entities in 2010, as was detailed in Issue 205 of this newsletter. Could alien life go from science fiction to fact? Given the pace of space exploration, it is increasingly conceivable that we may discover the existence of alien life or other planets that could support human life. Suppose observations point to a potential future home for humankind around another star, or the existence of life in our solar system – in the Martian poles, in the subsurface oceans of Jupiter’s frozen moon Europa, or even in the hydrocarbon lakes of Saturn’s moon Titan. Scientists will immediately start pushing for robotic and even human missions to study the life forms in situ – and funding agencies, caught up in the excitement, might be willing to listen. If life forms (even fossilized life forms) are found in our solar system, for example, the origin of life is “easy” – that any place in the universe life can emerge, it will emerge. It will suggest that life is as natural and as ubiquitous a part of the universe as the stars and galaxies. The discovery of even simple life would fuel speculation about the existence of other intelligent beings and challenge many assumptions that underpin human philosophy and religion. The Vatican sponsored astrobiology conference was a landmark event. It showed that the Vatican was willing to officially sanction public discussions on the existence of extraterrestrial life. More significantly, it showed that the Vatican was willing to initiate a comprehensive dialogue on the theological implications of the discovery of intelligent extraterrestrial life. The Vatican’s astrobiology conference is yet one more sign that major global institutions are preparing for some kind of formal disclosure concerning UFOs and/or extraterrestrial life. This is a direct outcome of a series of landmark meetings at the UN beginning in February 2008 that led to the adoption of a new openness policy. Per the Zetas, this is on the agenda at the World Economic Forum not because it has anything to do with the economy, not because the attendees are trying to formulate a leadership strategy, but because the elite fear a loss of control. ZetaTalk Comment 1/26/2013: Their stated fear is that official admissions on evidence of life elsewhere in the Universe would “challenge many assumptions that underpin human philosophy and religion”. But how does this affect the economy? It affects the control that the participants in the forum assume they have over mankind. Religion works by fear, the threat of being damned to Hell if one does not follow the rules, and the enslavement of mankind by debt also works by fear. Now come the aliens, showing by the maneuvers in the skies that mankind’s technology, fighter jets and missiles, cannot affect them. What this says to mankind is that their leadership is ineffectual and paltry. What this says to the elite is that mankind might be less likely to take orders from them. How does this translate into Medvedev driving the process of alien disclosure, to educate the public? This is the leap the public makes, hearing that alien life will be on the World Economic Forum’s agenda. The public is interested in disclosure. The elite are interested in putting on the brakes. Russia has always been more open about the alien presence and the near presence of Nibiru, aka Planet X, because their government has not been dominated by religion as have the US and other western nations. China is likewise more open, with their Ghost Cities visible and known. Cover-ups take effort, work and energy best spent elsewhere. Medvedev’s role during the forum will be to reassure the nervous elite, though this will have little effect on their anxieties. So what kind of disclosure would Russia make, were they to take the lead? There has been supposedly leaked KGB information on crashed ships and alien bodies, sold on the black market in Russia, but is this true? Per the Zetas, just some bragging to put Russia on the same footing as the US and Brazil. If the US had a Roswell incident in 1947, and Brazil had a similar episode in 1996 with a crashed ship and injured or dead aliens, then Russia could have a similar episode in 1969! Or so goes the claim. 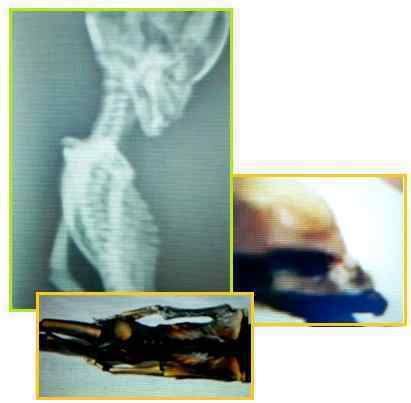 ZetaTalk Response 1/5/2013: Is the alien autopsy in this footage, supposedly secured from secret KGB files, real, and if so, what were the circumstances surrounding this particular corpse? We have repeatedly stated that outside of the Roswell incident in 1947, and the more recent Brazilian Roswell incident in 1996, there have been no crashed ships retrieved by humans, and these two incidents were deliberate on the part of the aliens who were attempting to contact the military in the respective countries. Where crashed ships can occur, as in the Shaitan Mazar incident in 1991, they are cleaned up by the alien group involved. The first clue that the autopsy is false it that it is being bundled with this staged story about a crashed Russian ship. 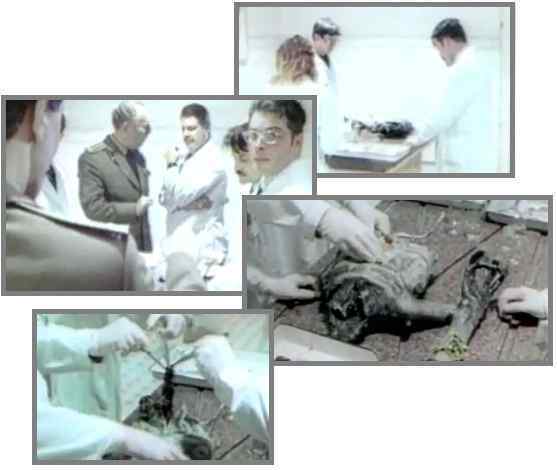 The second clue is the sloppy procedures conducted during the autopsy. Where are the hair nets? Where is the protective gear to prevent infection of the technicians? They tear the rib cage open with their bare hands? Amateurish, at best. Dr. Steven Greer has hit the news once again, this time re the supposed discovery of a tiny alien body on the Atacama Desert. Per the Zetas, this is a hoax that will neither be proven or disproven, by design. Two years ago Dr. Steven Greer hopped on a plane and flew to the Atacama Desert in South America where he was the 3rd person to hold a very special extraterrestrial being in his hands. X-Rays have been taken that are astonishing ! This extraterrestrial is about 6 inches tall and believed to be 5 to 7 years old. This extraterrestrial looking being is currently being tested to determine once and for all the validity of this alien looking being. Details about the find are vague, other than to point out the project is being led by Dr Steven Greer, a renowned UFO hunter and supporter of many provocative extraterrestrial theories. ZetaTalk Comment 2/2/2013: Is there any validity to the story about a tiny extra-terrestrial collected from the Atacama Desert? This is a hoax, which will never be proven or disproven, by design. What is the point? Greer is a puppet of the establishment, he and his assistant simultaneously given a type of implanted cancer in the past to emphasize that he should do what the CIA requested of him. So Greer should be considered a mouthpiece of the establishment, an unhesitating and highly cooperative mouthpiece. What is the point of claiming he has access to a tiny alien body? 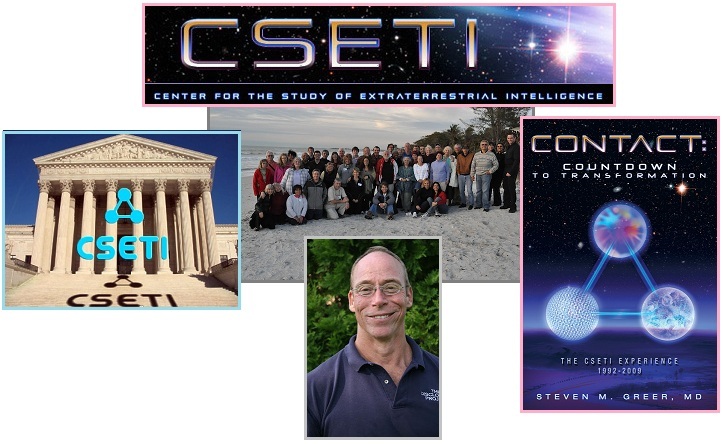 Greer is known for having established the CSETI organization in 1990, running workshops where he claims the group can “call down a ship”. Oddy enough, Greer simultaneously developing cancer in 1997 with his young female assistant, Shari Adamiak. He recovered. She died. Perhaps that was by design. Greer was in the news pressing the US government on disclosure in 2001. And now he is once again in the news. Per the Zetas, mankind should just give The Call and have their own visitation experiences. Decline any guidance by Dr. Greer and the CIA. My right-hand assistant, a member of Congress who was working very closely with us, and myself, all got a deadly type of cancer in the same month - different kinds. I don't talk about this publicly much because people say, "Come on!" But it absolutely can be done, it WAS done, and everyone DIED but me. I was devastated, and it took me 18 months to recover. Both myself and CSETI research director Shari Adamiak have been diagnosed with metastatic cancer. Both have appeared, rather enigmatically, at the same time, a fact which seems like a rather strange coincidence. I have been diagnosed with metastatic malignant melanoma, and another [second] lesion was removed yesterday [July 2] and confirmed to be malignant melanoma. The primary cancer has never been found. However, I am otherwise doing well and hope no further lesions will be found. Shari has been diagnosed with metastatic breast cancer of the right breast, with metastasis to the right axilla. ZetaTalk Explanation 3/17/2007: Greer is someone who alternately wants to tell the truth and allows himself to be manipulated. He was given cancer some years ago, recovered, but his female assistant who was likewise inoculated with cancer died. This left him very eager to cooperate. The CIA, whose hand can be sensed in this game, have always wanted to assert that humans are at least equal to the visitors, if not superior. They likewise have wanted to assert that the citizenry should cling to their government, their organized religions, their military, and not get cozy with the visitors. Thus, they would like to control the awakening process, which they are cut out of utterly.